Fully Automatic and All Metal Detectors- Your deector detects all kinds of metal objects. Unless you have set for some objects that you don not want to detect. LCD- The LCD with light, it improve to identify the metal in night or caliginous outside. Target Identity:-The detected objects are shown on the LCD display. You can decide immediately if the objects worth to be recovered. Unwanted Target Elimination- You can set the detector not to respond to some objects. Unique Tone for Target- You don not have to keep watching the LCD display, when an object is being detected, an unique tone corresponding to a target will generate. You may even searching when there is little or no light. 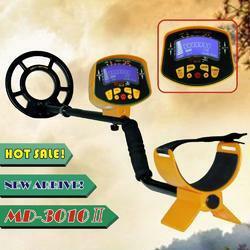 Looking for Gold Detector ?